It’s Sunday! What does that mean? Brunch with friends, relaxing with a book, sitting down with family for dinner, taking a walk with your dog or petting your cat, getting in some much needed yoga, being grateful for all the good in your life. 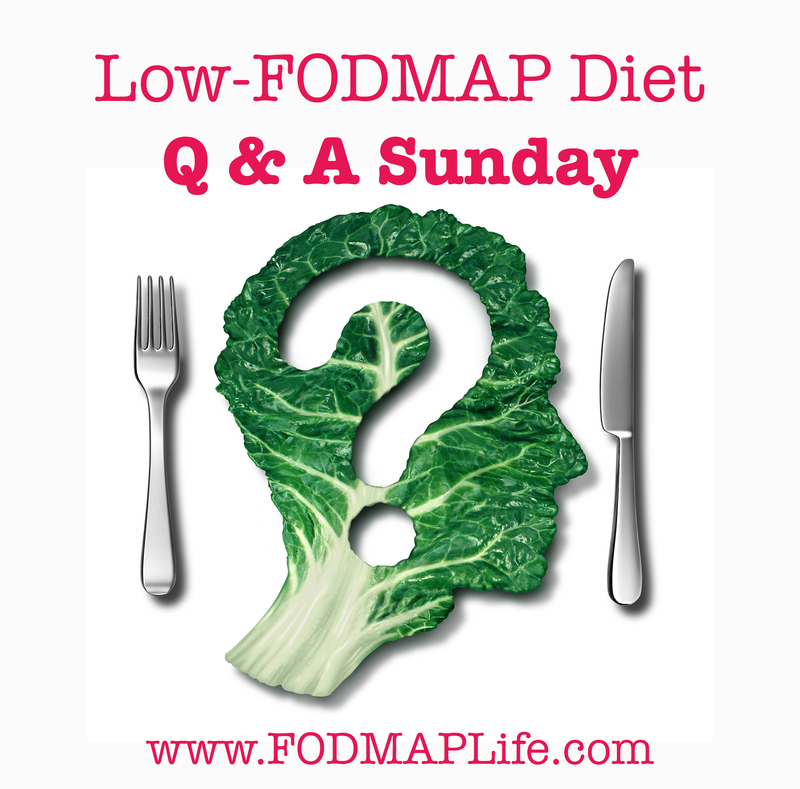 That sounds like a perfect Sunday to me 🙂 Sunday also means that it’s Q & A Sunday, a great time to learn from other great #FODMAPer questions. When ever you see the image below on my social media channels, just ask your question below the image and check my blog the following week to see if I’ve answered your question. Take this opportunity to read other fans’ questions as you will learn much about the low-FODMAP diet! Answer: I would not say that garlic and onions are not toxic for people with IBS, but they certainly do cause unwanted symptoms and many health experts agree they may be the biggest contributor to gut symptoms in the Western diet since they’re found in so many foods. For me, garlic and onions are the worst FODMAP culprit (followed by excess fructose). These fructans are a type of oligosaccharide, the “O” in FODMAPs. This carbohydrate as well as GOS are poorly digested by every human being because we lack the enzymes that help to break down and absorb the components of them into our bloodstream. With garlic and onions I would say the thing you have to be cautious about is being proactive about knowing what’s in your food should you choose to eat out and understand the symptoms you might endure. Use my food and symptom diary to keep track of all the foods and drinks you consume, as well as any symptoms. Whether you are working on the diet solo or with someone trained in the low-FODMAP diet, this diary will help you to better (and more swiftly) understand your triggers. 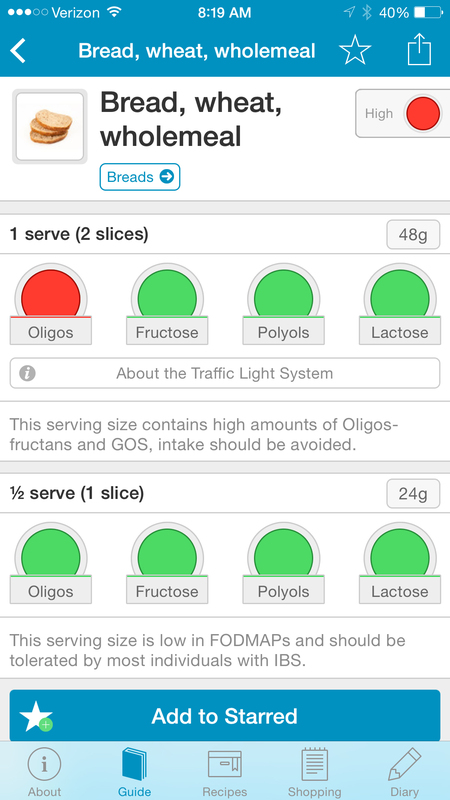 Download the Low-FODMAP Diet app from Monash University and please take the time to learn about using the traffic light system. That’s it for this Sunday. Don’t forget to follow me on social media and sign up for my newsletter! Follow/like/comment on Facebook, Instagram,Twitter and Pinterest. On a daily basis I receive dozens of questions, and they are really good questions! I really enjoy answering as many questions as I can and thought sharing them would be so helpful to you. Welcome to Q & A Sunday, with this post being the second installment (read last week’s post if you didn’t, you’ll find some great questions). When ever you see the image below on my social media channels, just ask your question below the image and check my blog every Sunday to see if I’ve answered your question. Take this opportunity to read other fans’ questions as you will learn much about the low-FODMAP diet! Answer: The overall goal of during the Elimination Phase of the low-FODMAP diet is to reduce the load of HIGH FODMAPs consumed at each meal or across the day. Then during the Challenge Phase, as advised by a FODMAP trained nutritionist or dietician, small amounts of FODMAP-containing foods are re-introduced through a series of “challenges.” You can have the items you mentioned on the low-FODMAP diet but in specific servings. Having them in their specified servings ensures that you do not consume high amounts of FODMAPs. Also do not get wheat confused with gluten. This is a diet that negates high amounts of wheat, but it’s not a gluten-free diet, and the only people who need to absolutely stay away from wheat and gluten are people with celiac disease or other people who’ve been instructed by their doctors due to an auto-immune disease. If you had pulled up wholemeal bread under the “Breads” list you would have just seen the red traffic light. Don’t let the red traffic lights deter you. Not all foods listed with red traffic lights are completely off-limits. In this case, wholemeal bread is LOW in FODMAPs (Oligos-fructans and GOS) as long as you stick to one slice. Answer: This is a great question. I’ve personally endured a few life events that have set me back emotionally, physically and mentally. From a bike accident, to no longer competing in endurance sports, to IBS, two back surgeries and a family member who caused me great anxiety, I had my share of pain. But then I had great pain and loss. It was the hardest time in my life and it felt like someone threw a brick at my chest – that was when I lost my Mother in July of 2014. She was my calm, my rock. Not too long after she passed, I found out I was expecting our baby boy – a beautiful gift from my Mother I am sure. *When you have to ‘go’, don’t delay! Get to “the john” ASAP. *Practice meditation. Pick a time everyday that will work for you and give yourself 10-20 minutes of quiet time to breathe and think about all the things you are grateful for – and picture yourself healing your gut and IBS. Picture yourself happy and comfortable. *Make sure to do at least some physical activity (a short walk, workout at the gym, clean the house, park farther away from the store/work). Just moving can help relieve anxiety and help your bowels to function healthfully. That’s it for this Sunday. Don’t forget to follow me on social media and sign up for my newsletter! Follow/like/comment on Facebook, Instagram, Twitter and Pinterest. There’s still time left for you to spread awareness about #IBSAwarenessMonth ! We are currently holding a contest on Facebook and Instagram (one winner will win from each). All you have to do is comment with your biggest Low-FODMAP challenge and a winner will be selected at random to win The Everything Guide To The Low-Fodmap Diet: A Healthy Plan for Managing IBS and Other Digestive Disorders by Dr. Barbara Bolen and Kathleen Bradley, CPC. U.S. residents only please. Learn MORE bout the book below! Take part in our giveaway and share it with friends and family asking them to enter as well! Joining the Digestive Health Alliance and use your voice to make a difference. Did you know that Irritable Bowel Syndrome (IBS) affects over 58 million (1 in 7) Americans and in developed countries, it may affect up to 1 in 5 adults(1)! The cause of IBS is still unknown, but experts believe symptoms of IBS are brought on by a disruption to the interaction between brain, nervous system and gut and that food, stress and/or a person’s environment can act as “triggers” for symptoms. Why do these crappy foods potentially trigger disease and gives us all sorts of reactions and complications? 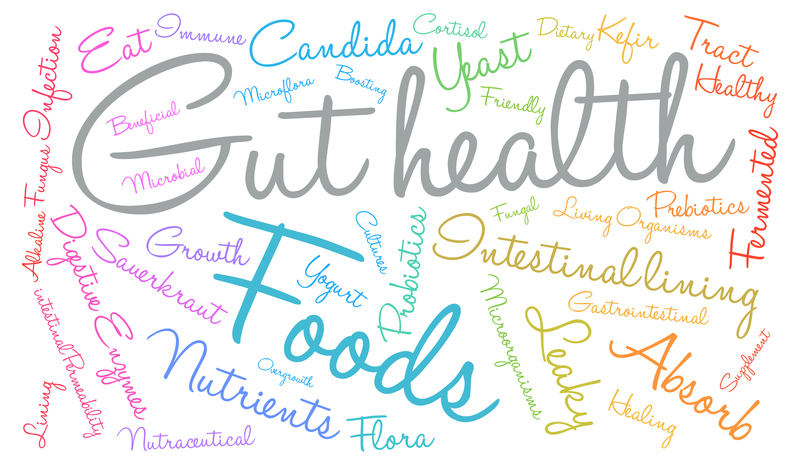 It’s because 70% of the body’s immune system (your first line of defense) is connected to the digestive tract. So throwing garbage food into your digestive system makes it even harder for your body to do the rest of its job – like fight off free radicals and foreign invaders. Eat as many nutrient-rich foods as possible and remember that crappy food choices tend to make IBS symptoms worse and the rest of the population – sick, tired and moody! There is no “cure” for IBS, however, it can be treated and symptoms can improve if an IBS patient works with their doctor. A gastroenterologist, family doctor, or general practitioner can help to rule out possible causes from the patient’s past and current health history, and there are different blood and breath tests to try. The next step is to work with a qualified professional trained in digestive health issues to carefully plan and manage the patient’s diet and lifestyle. Examples of people who can help are: Certified Nutritionists or others trained in nutrition (like a Holistic Health Practitioner, Physical Therapist, Chiropractor, etc.) or a Registered Dietitian. If stress seems to be playing a large role in IBS symptoms, opt for cognitive behavioral therapy, acupuncture, hypnosis, yoga and/or meditation. Remember to enter our giveaway to win this helpful book! by Dr. Barbara Bolen and Kathleen Bradley, CPC. BUY this book now! Just click here. If you suffer with symptoms of IBS, you know that digestive troubles and pain can disrupt your day-to-day life. Fortunately, researchers have come up with a new treatment plan to help you control symptoms: a low-FODMAP diet. FODMAPs are a collection of short-chain carbohydrates that are difficult to digest and found in many common foods, like wheat, milk, beans, and some vegetables, fruits, and sweeteners. The Everything Guide to the Low-FODMAP Diet walks you through the step-by-step process for identifying your individual sensitivities–and gives you options and substitutions so you can enjoy your favorite foods again. Dr. Barbara Bolen, an IBS specialist, provides advice and tips for developing a personalized and realistic healthy eating plan. And with 150 low-FODMAP and gluten-free recipes, you can reduce digestive distress and feel great while enjoying satisfying and nutritious meals! Thank you again to Dr. Bolen and Kathleen for writing this book and running a giveaway with me! Sources: IBS.org, IFFGD.org, (1) McFarland LV. State-of-the-art of irritable bowel syndrome and inflammatory bowel disease research in 2008. World J Gastroenterol. 2008;14(17):2625-9. Hungin APS, Whorwell PJ, Tack J, Mearin F. The prevalence, patterns and impact of irritable bowel syndrome: an international survey of 40 000 subjects. Aliment Pharmacol Ther. 2003; 17(5):643-50. Posted on April 25, 2015 May 10, 2015 Author ColleenCategories IBSTags #IBSAWARENESSMONTH, fodmap food list, fodmap foods to avoid, fodmap shopping list, fodmaps food list, IBS best diet, immune system and ibs, low fodmap grocery list, what does fodmap stand for1 Comment on #IBSAwarenessMonth Low-FODMAP Book Giveaway!